Should I reduce the Bt trait acreage in the 2017 corn crop to cut production costs? The economics of 2017 corn production have challenged many farmers with minimizing losses per acre. One area that some farmers have targeted for reducing costs is hybrid selection. Planting corn hybrids without Bt protection for European corn borer (ECB), corn rootworm or both will greatly reduce seed costs. However, if not careful, farmers could inadvertently reduce crop revenues if they select hybrids without considering yield potential or insect populations in their fields. Yield potential is the first thing to consider when selecting a corn hybrid. Bt traits only protect the yield potential of a hybrid; yield benefits only occur when targeted insects are above economic levels. When insect pressure is low, any potential yield gains from with newer, trait-protected hybrids have to be balanced against their higher costs. 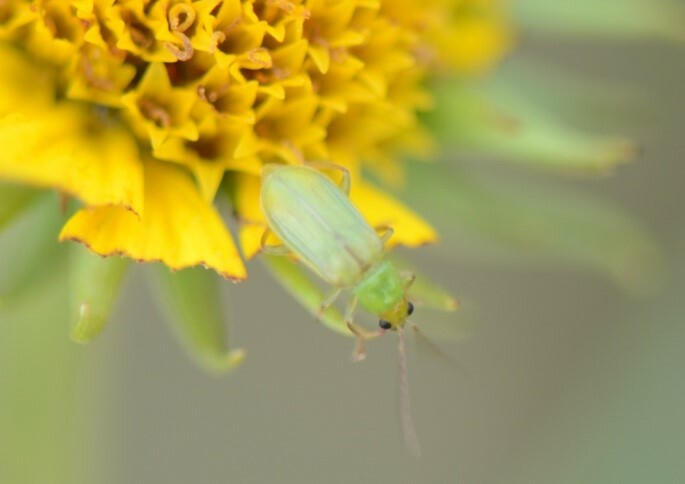 Switching to less-expensive seed only makes sense when yields are comparable or when seed cost savings exceed any reduced yield potential plus prospective insect losses that may occur. Complicating the decision is one important consideration - the limited availability of high-yielding non-Bt or single Bt trait corn hybrids for much of Minnesota. In many 2017 fields, planting corn without a Bt trait in 2017 will work out just fine but take stock of your insect risk! Figure 3. 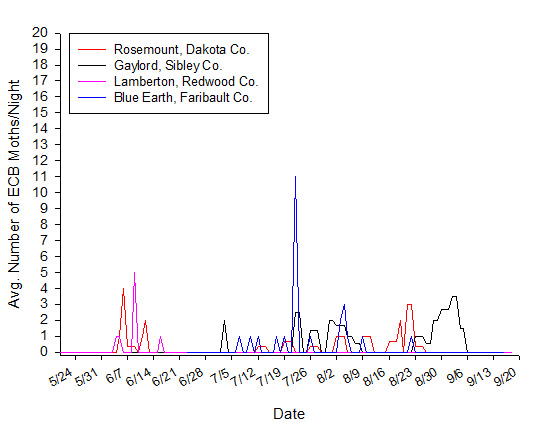 Overwintering fall European corn borer populations comparing a pre-Bt peak infestation with recent years. Burkness, Hutchison & MDA. 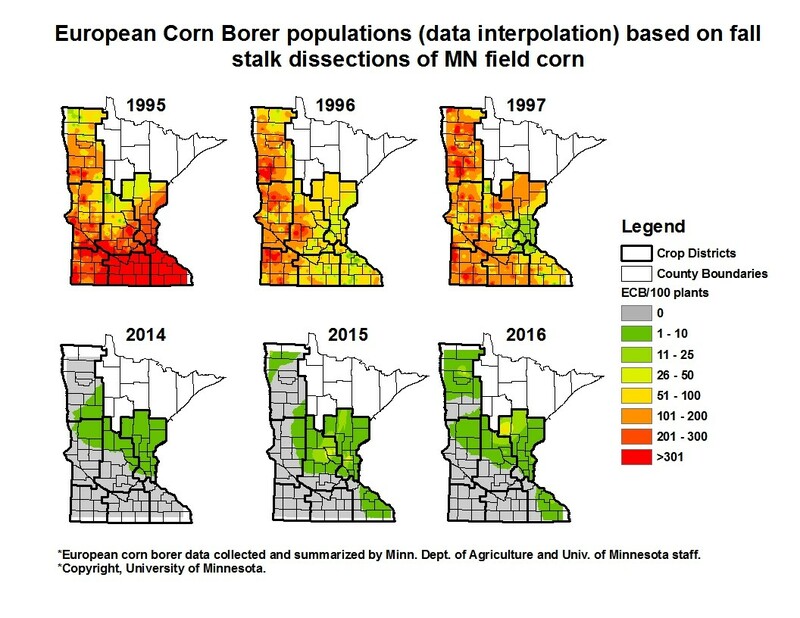 Compared to pre-Bt levels, European corn borer (ECB) populations are generally very low in Minnesota (Figures 2 & 3) and much of the Midwest. They have been effectively suppressed for nearly 20 years. 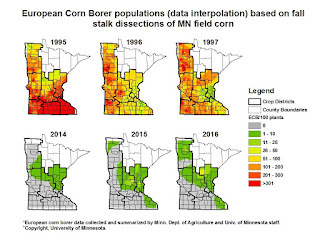 However, the risk of ECB infestations may be locally higher in areas where significant acreages of corn without Bt corn borer trait(s) were planted in 2016 and preceding years. Reports of damage in 2016 non-Bt corn demonstrate ECBs are still around and may be increasing in some areas. A temporary increase in non-Bt corn acreage should not dramatically increase the risk of damage and planting corn without Bt corn borer protection should be relatively low risk. The risk of economic damage likely increases as the proportion of local fields planted to non-Bt increase, particularly when the reduction in Bt has occurred for several years. Risk of yield loss from ECB can be reduced if you scout fields and apply a labeled insecticide where needed. Early and late-planted fields will most attractive to egg-laying 1st and 2nd generation moths, respectively. These fields should be receive scouting emphasis when planted to a hybrid without an above ground Bt trait. Where the univoltine strain of ECB occurs, scouting should focus on fields nearest pollination when the flight is underway, typically mid-July to early August. 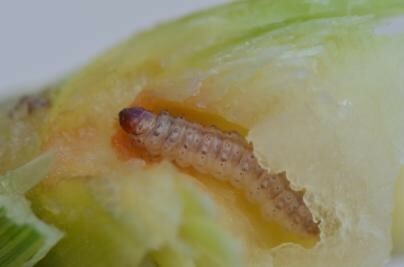 Larvae are susceptible to insecticides for 10-14 days during each generation. This limited window means you scouting efforts must be timed well. 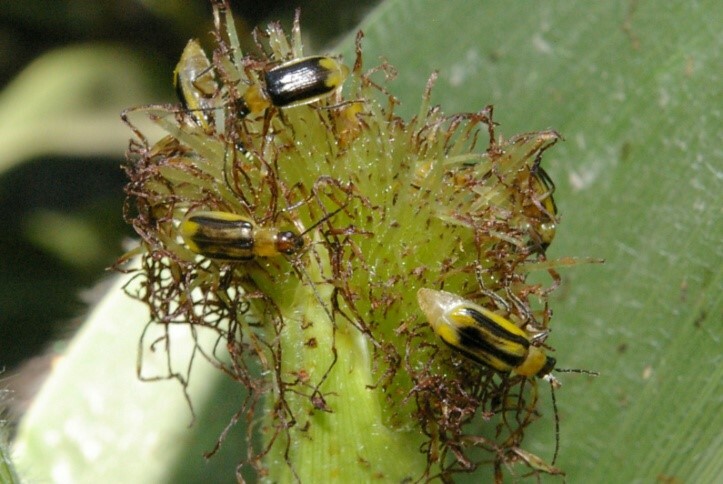 As corn grows, successive generations appear lower in the corn canopy; insecticide effectiveness declines with greater canopy interception by leaves above the larvae. Percent control for well-timed applications declines from 85% (1st generation) to 70% (univoltine) to 50% (2nd generation). Expect control to be noticeably lower than Bt traits (>99.5%). Bt corn should also receive some scouting attention late season. While ECB resistance to Bt -lepidoptera traits has not been detected yet, the effectiveness of several above ground traits has declined in some corn earworm, western bean cutworm and fall armyworm populations. Look for excessive leaf feeding from first-generation corn borers in earlier planted fields, stalk and ear tunneling in later silking fields from univoltine and second-generation corn borers, ear feeding from corn earworm and western bean cutworm, and late-whorl and ear feeding from fall armyworm. 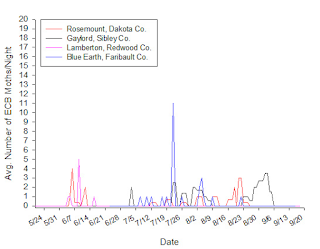 Corn rootworm populations in MN have declined because of overwintering mortality (2013-2014), and heavier spring rainfall that locally reduced larval survival in 2014-2016. Overall, in non-rotated 2016 corn, lodging damage from corn rootworms remained lower than during the most recent peak years of 2009-2013. In rootworm research areas, western corn rootworm populations have been building since the cold winter and wet spring of 2013-14. Resistance to several Bt proteins has been documented in Minnesota western corn rootworm populations and resistance the Cry 3Bb1 protein appears to be widespread. In both research and commercial non-rotated corn fields, single Bt trait and non Bt-RW hybrids are most likely to show high (> 1 beetle/plant) western corn rootworm beetles (Figure 4) populations. Even those Bt fields with pyramided traits might experience rootworm damage when populations are very high. Northern corn rootworm beetles (Figure 5), including the extended diapause biotype, appear to be increasing in some areas and scattered reports of extended diapause problems have re-surfaced after a 10-year absence. Do not assume that you do not have a potential 2017 rootworm problem simply because your corn did not lodge in 2015 or 16. Weather in 2016 was very forgiving, allowing ample opportunity for root re-growth, and root feeding was relatively early in corn development, allowing opportunity for brace root growth in absence of corn rootworm pressure. Corn rootworm population survival was excellent where spring rainfall was reduced and the mild, long, lingering fall was ideal for egg laying. Despite these cautionary notes, there is minimal risk for economic damage from western corn rootworms in 2017 rotated corn in Minnesota. Bt-RW resistance has not yet been documented in northern corn rootworm and with the widespread adoption of Bt-RW hybrids, extended diapause issues have been suppressed. Some reports of economic damage in rotated non-Bt RW corn this year and the more numerous observations of northern corn rootworms this fall should be a warning not to ignore the northerns. Rotated corn may still be at risk from extended diapause northern corn rootworm. Unless fields were scouted for corn rootworms in 2016 (corn after corn) or 2015 (rotated corn), some situations should be carefully pondered. Fields with hybrids maturing late for the area, fields with portions replanted or where crop development was delayed by flooded soils this spring, corn fields with late-season weed populations or adjacent to weedy soybeans, or soybean fields with heavy volunteer corn persisting late in the season face elevated risk from corn rootworms in 2017. Non Bt-RW hybrids will do well in fields where you have monitored western corn rootworm beetle populations and know that they were below threshold (0.75 -1.0 beetles/plant or 4 beetles/trap/day) in 2016 and/or northern corn rootworm populations were also low in 2015 corn. Fields where you know or suspect economic beetle populations exist may benefit from an at-plant insecticide, a hybrid with a Bt-RW pyramid (two different Bt RW proteins), and in the worst case scenario both. However, University studies typically do not reveal economic payback for insecticides layered over working Bt traits, especially with pyramided rootworm traits. Soil insecticides do not perform as well as Bt traits in root protection (expect 60% control or less compared to >98% for working Bt pyramids). In Bt resistance situations, soil insecticides do not make up for failing traits. There are no effective rescue options for larvae when it comes to rootworm damage detected post-emergence. If applying granules, apply in-furrow (IF) or replace banders every 3-4 years. If applying liquids, make sure liquids are placed IF. Follow label directions if mixing with or injecting into a liquid fertilizer. Do not use a 2 X 2 placement. Bt traits are a form of insurance. Moving away from Bt traits means that you are assuming the risk of insect attack and its management. Risk is generally low right now for European corn borer and corn rootworms but risk is not gone. You can either choose to ignore that risk (and your fields) or minimize that risk through active management (scouting + insecticides).